Locust Grove is a historic 18th-century farm site in eastern Jefferson County in Louisville, Kentucky. Resting on a 55-acre property, the site is a National Historic Landmark and operates as a historical interpretive site for the public to enjoy. Owned by the Louisville Metro Government, and operated by Historic Locust Grove, Inc., Locust Grove features a beautifully preserved Georgian mansion from the late 1700s, various farm buildings, landscaped gardens and wild woodlands and a new Visitor’s Center with a museum, meeting spaces and a gift shop. The estate’s main feature is the Georgian mansion that was built in circa 1790 and home to the Croghan family. The mansion also acted as a gathering place for famous people such as Lewis and Clark, George Rogers Clark, and various U.S. Presidents. Restored to its former glory, the mansion takes a center in the midst of rolling pastures, shady woodlands, quaint farm buildings and beautifully landscaped gardens. The purpose and mission of Locust Grove are to interpret, preserve and maintain William Croghan’s historic estate, and to share the stories of the people who played a role in the development of the site. Locust Grove also stands as an excellent example of early Kentucky architecture and craftsmanship, and a tribute to the history and heritage of the property. 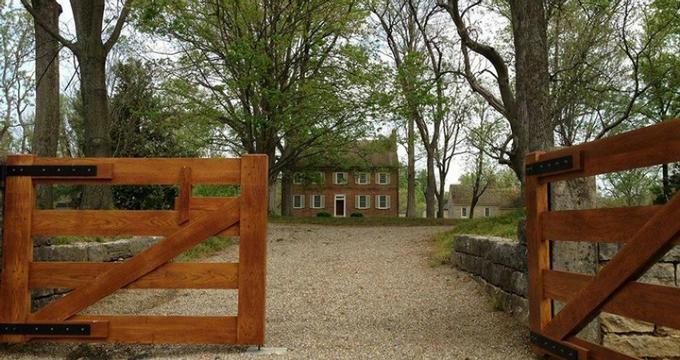 Situated just six miles upriver from Louisville, Locust Grove tells the story of its owners and builders, William Croghan and George Rogers Clark, the hardships they endured and the lifestyle they led from farming the land to raising their families. The heritage of the house is wrapped up in the story of America’s beginnings and played host to many famous figures, being a pivotal stop for an entire generation of American luminaries, including artist John James Audubon and President Andrew Jackson. Locust Grove was sold by the Croghan family to riverboat captain James Paul in 1878 and then became the property of Richard Waters of Hermitage Farm in 1883 where it remained until 1961 when the estate was purchased by Jefferson County and the Commonwealth of Kentucky. Following an extensive restoration which returned the mansion and estate to its former glory, Locust Grove was opened to the public in 1964. Locust Grove offers a variety of educational programs that focus on the history of the site and the settlement of Kentucky, ranging from tours and field trips to the museum and grounds to special workshops and classes. Pioneer Days tours explore life on a farm in the 18th century, while Craft Sampler tours enhance the Pioneer Days tours with costumed demonstrations such as woodworking, cooking and spinning. Work & Play classes offer students the opportunity to learn about the daily life of children on the Kentucky frontier in the 1800s – how they played, learned new things, and worked on the farm. The History Tour delves into the history of Locust Grove, its people and the impact it had on the region, while the Locust Grove & the Frazier Museum Field Trip visits both the Frazier Museum and Locust Grove, with an introductory film and tours of the house and outbuildings. Life Along the Ohio River: Locust Grove & Louisville Water Field Trip visits both the estate of Locust Grove and the Louisville Water Tower Park. Locust Grove is located at 561 Blankenbaker Lane in Louisville and is open Monday through Saturday from 10:00 am to 4:30 pm and Sundays from 1:00 pm to 4:30 pm. Visitors can explore Locust Grove on guided tours, which run each hour on the quarter hour. The tour begins with an introductory video, followed by a docent-led tour of the house and grounds, which lasts 45 minutes and a visit to the museum gallery. Locust Grove can be hired for special occasions such as weddings and other social events, as well as business meetings corporate functions. The estate grounds include the formal gardens and manicured lawns for outdoor events (tents may be rented), and the porch of the historic house for more intimate functions. The Visitors' Center building is home to the Audubon Room, which features an auditorium, and a catering kitchen, which can be rented together or separately. Additional services such as catering or event management can be arranged.